HAPPY 2018!!! Can you believe it?? 2017 just flew by. And now here we are in January. The beautiful holiday decorations are coming down, but it’s still bitterly, uncomfortably cold out there. Once New Year’s Day passes and everyone is going back to work after all the holiday fun and excitement, and there are no upcoming holidays to look forward to until Valentine’s day, it’s so much harder to handle the cold. The holiday decorations and the excitement of time off with friends and family, or even just lounging on the couch, makes even the coldest days more bearable. But in January those cold, brutal days become miserable. Especially for those of us who have to be outside in it day after day and don’t get snow days. So I’m here to help make your January just a little bit less miserable – with hot cocoa month! This whole month of January I will be sharing recipes to make your own hot cocoas from scratch. Today I’m going to kick it off with a basic hot cocoa recipe. There is nothing better than a good, rich, delicious, hot chocolate to warm your whole body! To make hot chocolate from scratch, I did a ton of research and it turns out, depending on the chef or chocolatier, the perfect hot chocolate ranges from 2% milk to whole milk to heavy cream. And it ranges from dark chocolate to milk chocolate to powdered chocolate. There are also a range of add-ins from salt to dry milk to cornstarch to…well…pretty much anything. I probably read 15-20 different ways to make the best hot chocolate. So I also tested them for you. I lost count along the way, but I probably made hot cocoa somewhere between 15-20 different ways. And I can promise you, this is the way to go. The powders are really hard to dissolve – cocoa powder, dry milk, cornstarch – they all seem to form clumps when you’re using just a whisk to mix the hot cocoa. And as you know, I like my recipes to be simple and easy for the home baker so I really wanted to be sure this hot chocolate didn’t use any equipment. When you use dark chocolate alone, it is good, but seems like it’s missing something (or as my husband puts it, it needs layers of flavor…he watches a lot of cooking shows). So the dark chocolate with a little bit of milk chocolate for some flavor layers comes out to perfection. And the salt, I know it seems strange, but it just enhances the flavors. 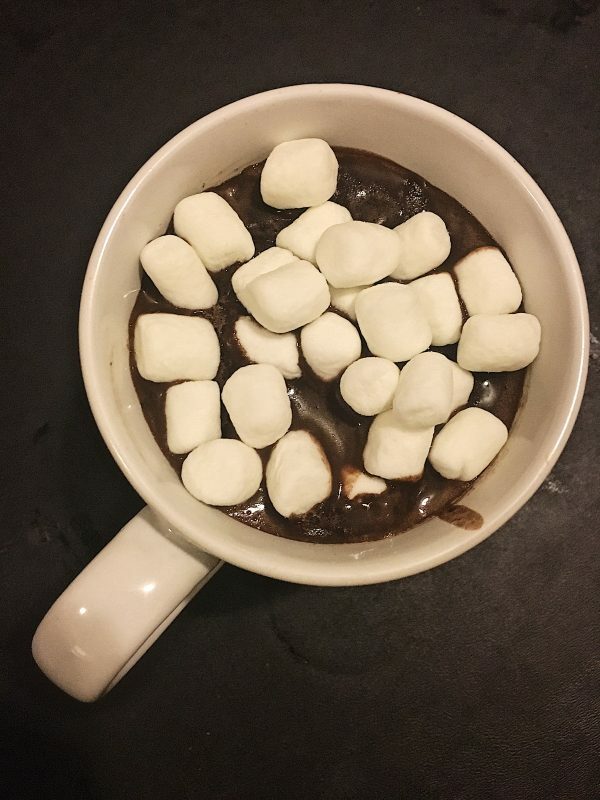 So now that we have survived the bomb cyclone and the temps are just depressingly cold, warm yourself up and cheer yourself up with this delicious, homemade (and quick and easy to make) hot cocoa. And make sure to keep checking back because after this basic recipe, I have a lot of exciting flavors of hot chocolate coming your way! And because you all got me to 200 Instagram followers by midnight on New Year’s Eve, keep an eye out for a few extra recipes throughout the month of January! Combine both chips and brown sugar in a heatproof bowl (preferably with a spout), and set aside. When the milk looks like it's about to boil, remove from heat and pour into bowl over the chips and sugar. Let sit about 1 minute, then whisk until completely smooth. High quality chocolate will improve the taste of this recipe, but I'm always a proponent of using what you have on hand. I used Ghirardelli chips (60% Dark, and Milk), but you can also chop chocolate if you don't have chips. The chips just save a step! I used whole milk for my test recipes, but I think whatever type of milk you have on hand should also work fine. If you have heavy cream, that can help to thicken a lighter milk.